The days of your father’s old round Weber grill on the cement slab out back are over. Tastes change. Needs change. Who wants to be stuck indoors preparing a meal for guests when all of your guests are outside enjoying a beautiful day? In Wisconsin’s Fox Valley we don’t have a very long warm season, so we want to enjoy the outdoors as much as possible, whenever possible. Our built-in grill islands with heavy gauge, stainless steel grills with infrared rotisserie burners, warming drawers and cook tops give you cooking options you just can’t get with the big box, thin-gauge black grill on rollers of yesterday. Another built-in grill island constructed by Stonehenge! 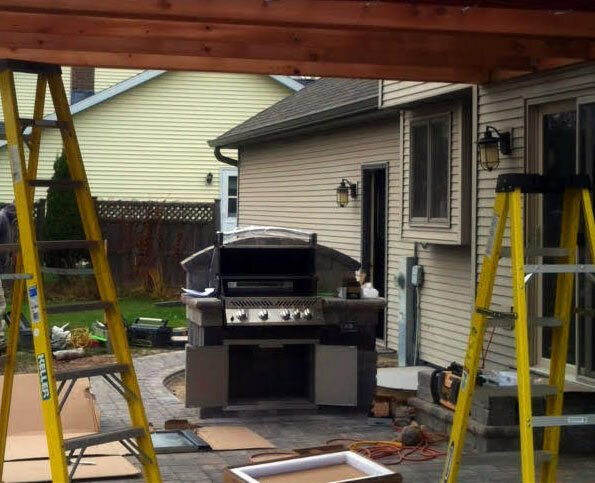 Your style and material choices are wide open with a Stonehenge-built grill island or outdoor kitchen. Face brick or stone veneer mortared over a CMU structure, or an island built entirely from man-made block, with a countertop of limestone, granite or even stained concrete can bring your cookspace into your play space. Add a working sink and a built-in, outdoor-rated refrigerator and you can have the full experience of a meal, from creation to consumption, right there on your patio. Top of page: Built-in grill with additional cooktop and Little Green Egg. Masonry construction, with veneered natural limestone over a CMU structure, with 2 1/4″ buff limestone countertop. Electrical and gas lines plumbed in. 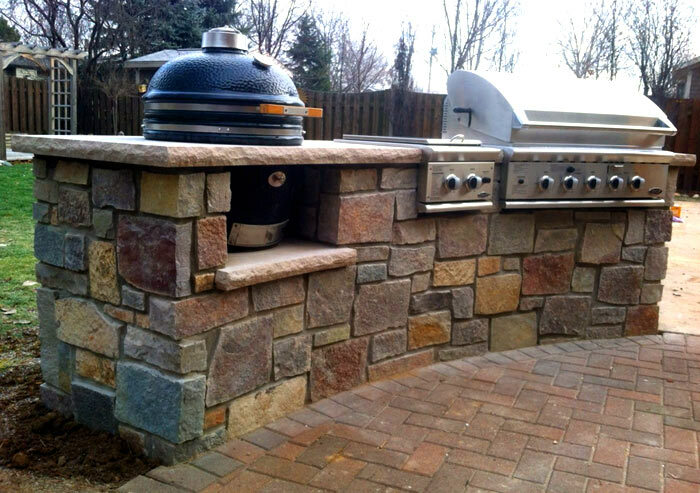 Above right: Built-in grill constructed from concrete segmental retaining wall block with a bullnose paver as countertop. Electrical line to power rotisserie run to island.